The Fishin’ Company announces partnership with Trace Register – The Fishin' Co.
seafood traceability. 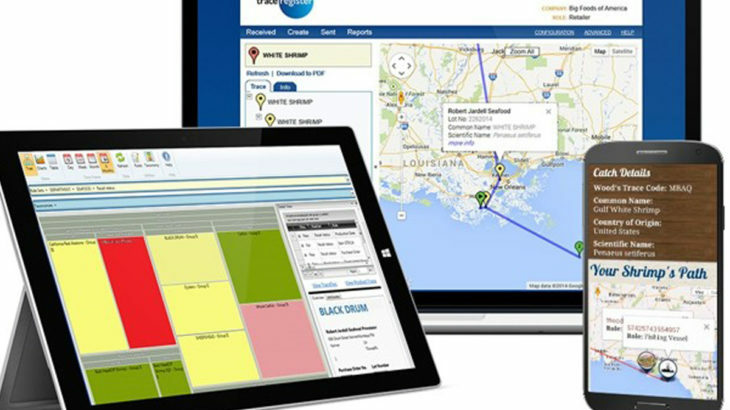 Trace Register will help to integrate The Fishin’ Company’s complex compliance, sustainability and traceability platforms into Trace Register’s single platform while providing a critical Seafood Import Monitoring Program (SIMP) solution. The Fishin’ Company requires that all products they supply their customers meet a wide range of stringent and detailed compliance requirements, including government regulations, customer requirements, certification reporting, and various internal sustainability and social responsibility specifications. These metrics apply to all stages within the raw material supply chain, including processing facilities, farms, boats, hatcheries and feed mills. The Fishin’ Company wanted an easy-to-use solution with a single place to store, use and share this vital information both internally and with their customers. “Trace Register’s end-to-end traceability transparency provides us with an easy way to achieve the assurance we need to verify that our products are sustainable, socially responsible, compliant, and of the highest quality,” said Heath England, Chief Operations Officer, The Fishin’ Company. TR Full-Chain Traceability and TR+ Analytics with CMCA (continuous monitoring continuous auditing) makes it possible to verify that products conform to The Fishin’ Company’s requirements, as well as those of their customers.The solution, built on a powerful platform to handle robust data requirements, is based on GS1 standards. Information from multiple sources about multiple products is in one system of records and available to all employees, making it possible to share specific information with customers. Analytics are used to verify data as trustworthy, automate alerts in near real-time to drive corrective actions, plus improve compliance and product quality. Trace Register solutions make it possible to provide the complete product story, while at the same time keeping designated information confidential.